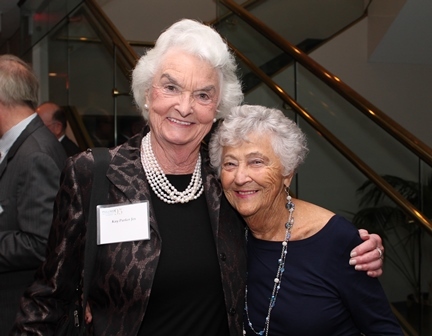 Pullman & Comley alumna Kay Parker Jex with Bridgeport receptionist and honoree Rene McNeil. BRIDGEPORT, CT: Pullman & Comley, LLC, one of Connecticut’s oldest and largest law firms, hosted a memorable event last month with its attorneys and alumni colleagues to celebrate the firm’s 95th anniversary. Founded in 1919 in Bridgeport, at that time one of the leading centers of industry in the nation, Pullman & Comley helped to shape the surrounding community and served as the center of a growing legal profession in the state. Throughout its history and growth to four office locations in Bridgeport, Hartford, Waterbury and Stamford, Connecticut, the firm has been involved in projects which have had a positive and lasting impact on the life of Connecticut residents, ranging from the construction of the Connecticut Turnpike and Merritt Parkway, to the reclamation of numerous brownfield sites across the state, to enhancing economic and cultural vitality in Connecticut’s major cities. Most recently, the firm has been involved in a variety of exciting projects that are reenergizing the State of Connecticut. In the City of Bridgeport, this includes the Steelpointe Harbor redevelopment project, the renovation of the historic Mechanics & Farmers building on Main Street, the expansion of Bridgeport Hospital’s Park Avenue Campus, and the development of Eco-Industrial Park, a renewable energy park on the site of a former landfill adjacent to Seaside Park. In Hartford and the surrounding suburbs, projects include the construction of three residential housing complexes at 179 Allyn Street, 5 Constitution Plaza and 777 Main Street and the development of a long abandoned lot in the city’s South End. Additionally, the firm continues to work on developmental transactions related to the expansion of Bradley International Airport in Windsor Locks, and Great Pond Village, a new sustainable community in Windsor. The October event also honored Rene McNeil, who this year marks her fiftieth year as Pullman & Comley’s Bridgeport receptionist. Joining the firm in 1964 – when postage stamps were a nickel and the Beatles had just stepped foot on American soil – McNeil recalled that by the end of the first week at Pullman, she had “fallen in love with the job and the people” and knew she’d be at the firm for a long, long time. From its inception, the firm has provided legal advice and counsel in traditional practice areas, but continues to adapt to the changing needs of its clients by adding new practices in areas such as cybersecurity and infrastructure protection, green development and alternative dispute resolution. With nearly 90 attorneys, Pullman & Comley is one of Connecticut’s largest firms and provides a wide range of legal services to clients in the New England region, as well as throughout the United States and internationally. Pullman & Comley’s major practice areas include business organizations and finance; environmental and land use; government finance; health care; labor, employment law and employee benefits; litigation; property valuation; real estate; regulatory, energy and telecommunications; and trusts and estates. The firm has offices in Bridgeport, Hartford, Stamford, Waterbury and White Plains. The firm is an active member of the Law Firm Alliance, an international affiliation of law firms. For more information, please visit www.pullcom.com.